A $10 million donation from a pair of UW-Eau Claire alumni will be a literal and figurative game-changer for the university and the community, providing a location for a privately funded 7,500 capacity multipurpose venue that will eventually replace the aging, undersized Zorn Arena. "This new larger venue would meet the growing event facilities needs of the university while also greatly advancing the Eau Claire community’s competitiveness in attracting business, entertainment, and sports activities.” – UWEC Chancellor James SchmidtThe university announced Tuesday, Aug. 5, that John and Carolyn Sonnentag, owners of County Materials Corp., are donating approximately $10 million in property and funds to the UWEC Foundation. 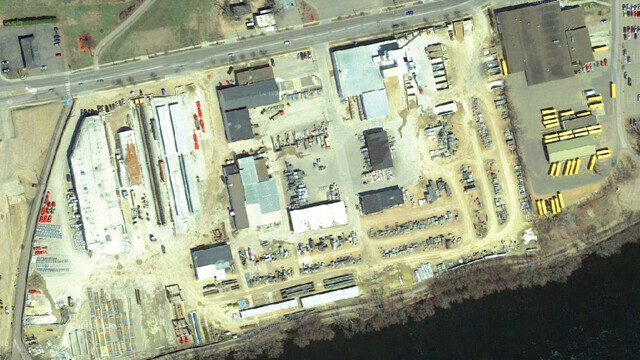 The gift – the largest in the UWEC Foundation’s 60-year history – includes 21 acres on Menomonie Street in Eau Claire where County Materials’ concrete manufacturing facility now stands. The property, 1111 Menomonie St., lies on the south side of Menomonie Street along the tree-lined bank of the Chippewa River. The Chippewa River State Trail wraps around its southern and western boundary, and to the east is Student Transit-Eau Claire’s bus facility. The university says that the property will be used for new fitness, recreational, and athletic facilities for the campus, and possibly the community: A joint-use agreement with the Eau Claire YMCA, which has sought for years to built a new facility, is under discussion. While a freshman in 1960 at what was then known as Wisconsin State College at Eau Claire, Sonnentag said he was impressed by how eloquently Leonard Haas, the college’s president, spoke about the institution’s dedication to excellence. “I hope Dr. Leonard Haas would be proud of the excellent event center we are about to build here,” Sonnentag said. He appealed to his fellow alumni to be generous with the project, too. AN EVENTFUL RIVERSIDE. 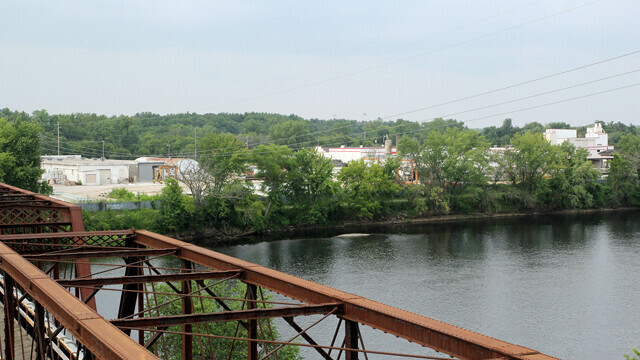 The university plans to raise private funds to transform the property (shown above, along the Chippewa River) into a new 7,500 capacity multipurpose venue, including fitness, recreational, and athletic facilities for the campus and community. “That was 43 years ago, folks, and we’ve been talking about it ever since,” Schmidt quipped, eliciting laughter during a crowded news conference at County Materials’ office. 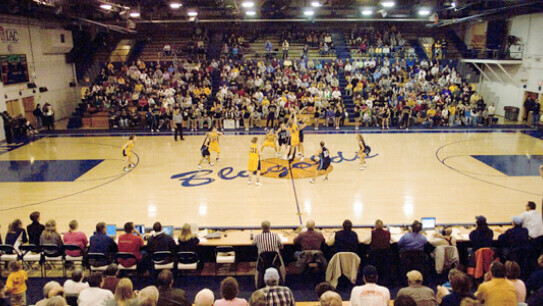 Mike Rindo, assistant chancellor for facilities and university relations, noted that the County Materials site is close to campus, Clairemont Avenue, and Interstate 94, as well as to Carson Park, where the Blugolds play football, and Hobbs Ice Arena, where they play hockey. “You really create a triangle of facilities that creates a destination,” he said. conventions, and other events to Eau Claire. For more than a decade, the YMCA has sought to build a new facility of its own; at one time it hoped to do so next to Carson Park, not far from the land now being donated to UWEC. The donation creates the possibility of the university and the YMCA building adjacent facilities that, while separately owned, could be shared by students and YMCA members alike. 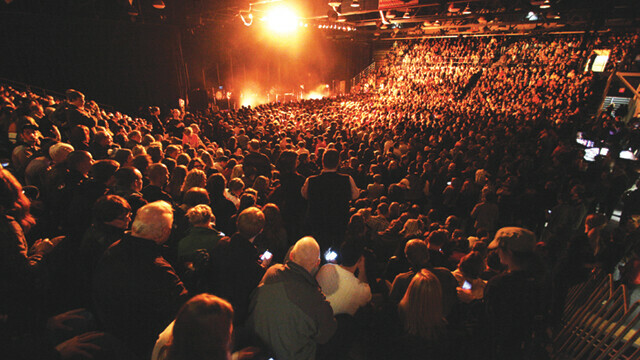 a Bon Iver concert back in 2011. UWEC Student Senate Vice President Jake Wrasse said a new multipurpose facility will help recruit students as well as keep those who live off-campus – particularly in the nearby Randall Park neighborhood – actively engaged with the university. “I think this is exciting because we can meet our facility needs and fully integrate (with) the community,” said Wrasse, who added that he felt UWEC students would be willing to help pay for the project through self-imposed fees, as they did with the new Davies Center. John Sonnentag said County Materials has several other properties in the area and plans on relocating its Eau Claire operation in two or three years to make way for the event center project. He added that the project won’t cause a loss of jobs or impact the company’s customers. In addition to donating the land, the Sonnentag Foundation is negotiating with Student Transit-Eau Claire to buy that company’s property, which sits between the County Materials plot and Hobbs Ice Arena. Sonnentag said County Materials and Student Transit will likely relocate at the same time. Kimera Way, president of the UWEC Foundation, said her organization is taking the first steps toward determining the best use for the Sonnentags’ property that aligns with the couple’s wishes. “The foundation will focus during the 2014-15 academic year to complete the planning, seeking input from students, the university and the general community on how to maximize the benefit of the Sonnentags’ transformational gift,” Way said.